Steel Rule Die Cut gaskets are an example of one of the most common forms of die cutting. When a steel rule die is created, it is bent and formed to customer specifications for cutting and stamping out custom parts and components. We start out with a sheet of steel that is bent and formed into a custom shape to match our customer’s dimensional requirements. The steel rule dies are then used on our programmable, traveling head press, to “punch out” different shapes from non-metallic materials. 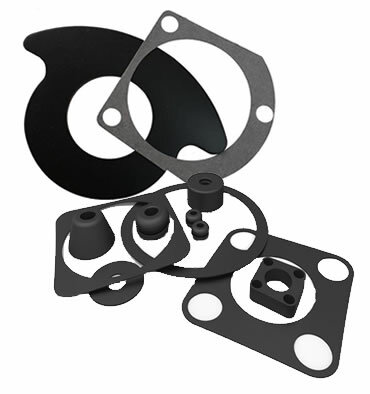 Food Grade Gaskets, Rubber Gaskets, Paper Gaskets, Fiber Gaskets, Sponge Rubber Gaskets, Cork and Cork Rubber gaskets are part of the endless list of materials that can be converted by die cutting. To create a Rotary Die Cut Gasket we use a cylindrical die on a rotary press to cut gaskets. As the die rotates, a large sheet of material is fed into the press at the same speed as the rotation. As the die makes contact with the material, it creases, perforates or cuts out the custom shape from the sheet of material.